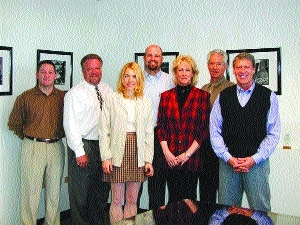 L to R: Landon Farley, Jim Saltz, Shelia Frank, Perry Rickel, Phyllis Deremiah, Ron Bergen and Tim Smith, the staff atCherry Creek Financial Group, delivers quick and easy service for all types of mortgage loans. While many Colorado companies are experiencing a slump in business that goes with the state’s cooled off economy, that’s not the case in the mortgage lending business. Even though real estate sales are a far cry from what they were just a couple of years ago, thousands of homeowners and investors are refinancing their mortgages to take advantage of interest rates that are lower than they’ve been in decades. Cherry Creek Financial Group, founded by Perry Rickel and Landon Farley in 1996, has ridden the crest of both waves—the sales frenzy of the late 1990s and the current boom in refinancing. According to Rickel, the company is successful because they make it as simple as possible for borrowers to complete what can be the biggest transactions of their lives. A company loan officer collects information in a phone interview before a client comes in the door, so the client knows what kind of paperwork to bring to the first meeting, and so the loan officer has some idea about how to structure the loan. Because the underwriting is done in-house, most loans are approved in 24 hours, and are closed in about three weeks. “I’ve met lots of friends who started with me as clients,” he added. Another valuable referral resource is the local realtor community. Although the company specializes in loans above the government’s Fannie Mae and Freddie Mac limits—currently $322,700—they can work with anyone. The company offers an extensive portfolio of loan products for first-time buyers, re-financers, investors, the self-employed and high net worth individuals. They have special expertise in putting together jumbo loan packages larger than a million dollars. The company can work with past bankruptcies, small credit dings and the client’s willingness to provide income verification. While most borrowers are happy to share all of their information, sometimes verifying income can be a problem. For the self-employed who have a large number of write-offs for tax purposes, or for high net worth individuals who may have a tax return that run dozens of pages, providing the necessary documentation can be difficult. While the borrower who is willing to provide all of the information may have more financing options, no-income-verification loans are an alternative for borrowers who need or want to go that route. The two most critical pieces for any borrower are credit worthiness and loan-to-value on the property. “The better the credit is, the better the interest rate will be, especially in a no-income verification scenario,” said Rickel. For more information on Cherry Creek Financial Group’s mortgage lending services, call (303) 813-9118, or visit [http://www.mortgagemint.com]. 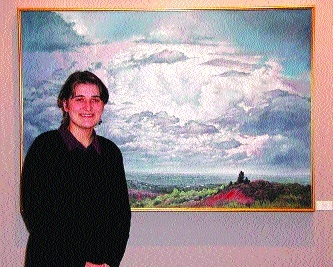 Deborah King, assistant director of Canaan Gallery in Southglenn Mall, with a landscape by Bob Simpich of Colorado Springs. The Denver art scene is replete with galleries that present art in all kinds of media and spotlight the work of artists from around the world, but only one gallery in the metro area specializes in faith-based fine art. In fact, Canaan Gallery in Southglenn Mall is the largest gallery of its kind in the country. The gallery displays 400 pieces of original art from more than 80 local and national artists who work in all styles and media, from abstract sculpture to traditional realistic watercolor and oil painting to jewelry. Many of the pieces in the gallery portray Judeo-Christian themes, but plenty of the works reflect the beauty of nature, such as large landscapes from Bob Simpich and watercolors by Lorraine Danzo, a graduate of the Pratt Institute. Simpich, best known for his work as a doll designer, is the owner of Simpich Dolls in Colorado Springs, a business that has been creating collectible Christmas dolls for over 50 years. The gallery also carries the original work of Suzy Schultz, whose illustrations grace the pages of “In Touch” and several other Christian magazines, as well as Joel Tanis, who specializes in whimsical interpretations of Bible stories for children. He’s well known for his illustrations in the New International Reader’s Version of the Bible for children. Gonerka founded the gallery in 1998, after talking with an artist friend he hadn’t seen in years, who said he had given up painting religious subjects because he couldn’t find gallery representation. Gonerka saw an opportunity to fill a niche, since there were fewer than 10 galleries in the country that carried faith-based art. His first gallery was located in a small store at Orchard and University, and because the space was limited, they would hang work at area churches to reach a wider audience. For the first three years, Gonerka ran the gallery by himself, but then began to add staff. King joined the gallery last October after receiving a degree in graphic design from Colorado Christian University, and Parker brings over 20 years of gallery experience in the western art Meccas of Scottsdale and Sedona. Two years ago, Gonerka moved the gallery to the upper level in Southglenn. Stepping through the door of the gallery provides a quiet and reflective respite from the hustle and bustle of the mall. The staff encourages people to come in and look, and ask questions if they feel the need. “Mostly, we just want people to come in and see what we have,” said King. The gallery has a small classroom where adults can take classes in watercolor and oil painting, and children can learn about drawing, pastels and watercolor. The two-hour class sessions are offered once a week and are limited to six students so that each student receives one-on-one help from instructors Melissa Barrett and Sandra Stemmler, both professional art teachers. the gallery, call (303) 794-6945.